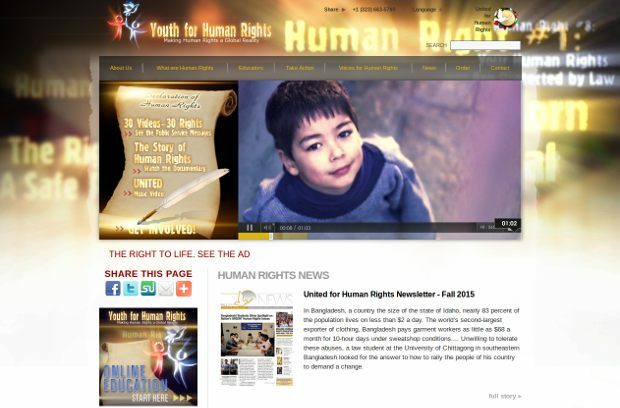 Youth for Human Rights International teaches human rights education both in the classroom and in nontraditional educational settings. They aim to reach people from diverse backgrounds, with materials which often appeal across generations. By teaching human rights through all means—from conferences and workshops to hip-hop and dancing—this message has spread around the world. Their materials include the UNITED music video—a street-savvy, multiethnic, anti-bullying message that has captured the imagination of people around the world. Their 30 short public service message videos depict the 30 Articles of the United Nations Universal Declaration of Human Rights. In less than a minute, youth can learn one of their human rights—and all of them in less than half an hour. The videos have garnered media attention as well, airing on television networks in countries worldwide.